15 of the Best (and Most Offbeat) Attractions in Utah! There’s no question that Utah attracts international attention for its diverse geography and associated recreational activities. And if you’re looking for something a little unusual to explore in Utah, you’re in luck as well. Utah is no stranger to the bizarre. Check out these 15 unusual attractions in the state. 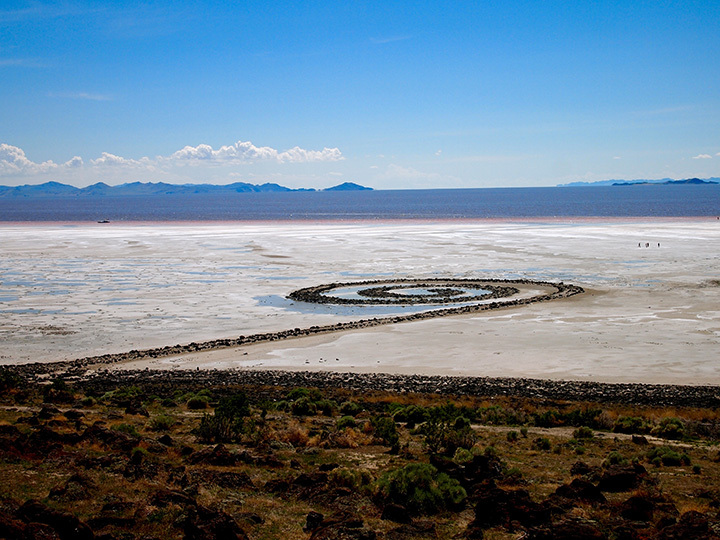 Situated on the northeastern shore of the Great Salt Lake, the Spiral Jetty (1970) is the creation of well-known American sculptor Robert Smithson. Created mostly with basalt rock, the piece is known as an “earthwork” and lies in the shape of an otherworldly counterclockwise coil. If you thought Western ghost towns were only the stuff of movies, think again. Thistle Ghost Town—located about 65 miles south of Salt Lake City in Utah County—features deserted houses submerged in water and mud that leave you with quite an eerie feeling. The uncovering of prehistoric life is alive and well in Utah, and especially so at the famed Trilobite Quarry in Delta where with pretty much any scrappy tools, you can uncover your very own trilobite fossils to keep. Home to car races as well as engagement photoshoots, the Bonneville Salt Flats are actually the stunningly bizarre residue of Lake Bonneville: A large body of water that practically covered all of Utah until about 13,000 years ago. If you’re a Pixar junkie, you simply cannot miss the “Up” House in Herriman. Not too far from Salt Lake City, this house is modeled after the house in Pixar’s “Up” and in recent years, has become a surprisingly popular tourist destination. There’s nothing quite like driving on a road with a precipitous and potentially fatal cliff on either side, right? If you’re into thrills, take a gander down this frightening thoroughfare. Stone Henge may be on the other side of the Atlantic, but artist Nancy Holt’s Sun Tunnels plays with similar ideas and is located near the Great Salt Lake. The piece (constructed in the late 1970s) features four large concrete tunnels positioned in the shape of an X. On each of the solstices, the tunnels form a perfect frame for the sun and provide an awesome experience for nature wonderers young and old. Petrified wood certainly is not an everyday substance, but in Utah’s Escalante State Park, this colorful wonder is around nearly every corner. So what is it exactly? Ancient trees that have, over time, quite literally turned into colorful stone due to a natural process known as permineralization. If you’ve ever wanted to live inside a rock, the “Hole n’ the Rock” in Moab, Utah, can serve as your inspiration. Albert Christensen began constructing his rock home in the 1940s, which involved a whole lot of digging and blasting. Now that Christensen and his wife have passed away, the home is a major roadside attraction. Legend has it that when Mormon leader Brigham Young arrived in Utah with a band of faithful pioneers, he stood at a point on what is now the east side of Salt Lake City and declared the area suitable for settling. To commemorate this legendary moment, a monument was completed in 1947 to mark the 100th anniversary of the pioneers’ arrival. Especially enchanting around Christmas time, Temple Square in Salt Lake City is nevertheless a worthy attraction any time of year. The Latter-Day Saint (or Mormon) Salt Lake City temple (a building where sacred religious ordinances such as marriages are performed) feels like it’s straight out of a fairytale. An adjoining LDS Church History Museum gives context to those unfamiliar with Mormonism. Apparently, a Salt Lake City woman fell victim to an unidentified “beast.” This intriguing headstone is definitely a cult favorite when it comes to weird Utah tourist attractions. North of Salt Lake City in Weber Canyon, “Devil’s Slide” is a strange geological formation featuring two parallel slabs of limestone protruding from the mountainside. No one really understands how the formation came to be, and it’s that mystery that keeps people coming back. If you want to see some funky sculpture, look no further than Gilgal Sculpture Garden in Salt Lake City. Hidden in an unlikely corner of the city between houses and businesses, this sculpture garden is definitely a bit wacky.